The long-term success of TBI requires the support and participation of local communities in all aspects of the work from construction to scientific research support. TBI helps to raise support and awareness via program coordinators based at the TBI field stations who work closely with the local communities on each side of the lake. Community members gather in celebration at the launch of the Loreng’alup Maternity ward. The vision of the Community Outreach Program is to make positive and sustainable changes in the lives of the local people that surround the lake in areas such as education, health, natural heritage awareness and environmental preservation. At Ileret, activities that TBI has supported in the past few years include the development of a health clinic, the hiring of teachers at the local school, and the provision of bursaries to enable local children to attend secondary schools in other districts of Kenya with over 40 students currently benefiting from the program. The community health program employs a nurse and operates a mobile health clinic that has a child vaccination program and provides reproductive health support to women. The Ileret nurse also carries out community HIV/AIDS screenings. TBI has helped to raise funds and goods in kind to supply Ileret’s primary school children with stationery, textbooks and other sundries. The salaries of eight teachers at the Ileret Primary School, and of one teacher at the Talesgaye Primary School, are currently covered by the TBI community program. A month-long visit by a team from Stony Brook University’s Dental School provided the first dental care ever to nomadic communities on the east side of Lake Turkana. A second team from the Health Sciences School at Stony Brook carried out a health assessment that led to a plan to build a small hospital at Ileret. At TBI-Turkwel a Ministry of Health nurse has been posted at Loreng’alup Clinic at the request of TBI to serve the neighboring communities and especially to provide prenatal and antenatal services to women. With support from TBI and a grant from the Kenya-based Safaricom Foundation, a maternity ward has been constructed at the clinic. 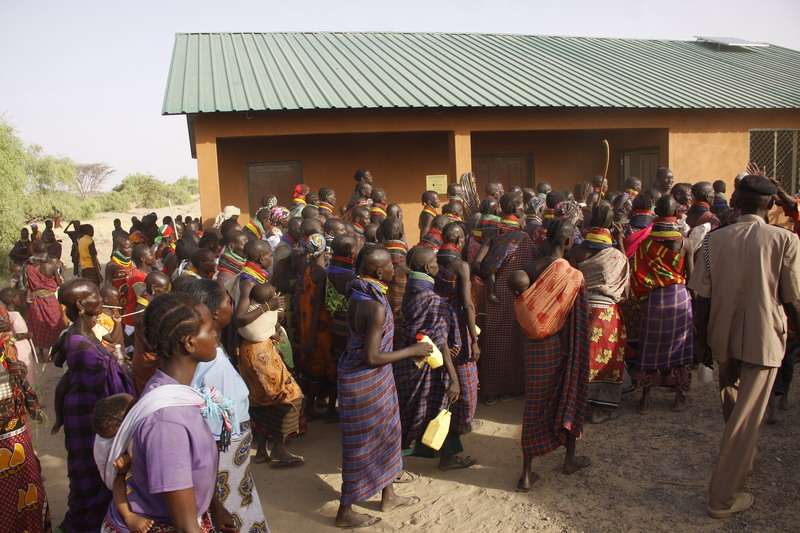 Access to maternal health care is a major concern in this part of Kenya and local women can now be assisted in childbirth close to home rather than making a 20-mile trip to the town of Lodwar. The bursary program is supporting over 300 students. In this arid region of Africa, dependent on livestock, relief food, and unpredictable rainfall, women living close to TBI-Turkwel in the village of Nakechichok have developed an innovative and exciting new way to address food insecurity. With the support of TBI and from the nonprofit group Friends of Lake Turkana, the Nakechichok Women’s Group has created a network of fenced-in gardens, irrigated with scarce-water techniques, which produce tomatoes, eggplant, melons, spinach, kale and other vegetables normally difficult to grow in a dry climate. In its first year of production, this network of gardens is supplying much-needed fresh vegetables to over forty households and generating a surplus of crops, which are sold to support future production and expansion, thus making this project self-sustaining.